AUSTRALIAN MADEOur Australian made sofabeds offer you extensive diversity in style, size, and textile selections. With single, double and queen bed options you are bound to find your perfect solution for your spare bed needs. All our sofabeds and modulars are made to order, with some items in stock for immediate delivery. Australian made in Sydney, our workmanship is of the highest quality, at the very best prices and the very best value. We source only from the best Australian Textile companies, use only Australian Dunlop Foams, and other high quality materials which all carry extensive guarantees. We carry a special relationship with our sofabed supplier who has been manufacturing in Australia since 1993. Select your style, your fabric or leather, your mattress type and we will make it for you! At Sofabed Specialists we pride ourselves in offering you the most comprehensive range of sofabeds for all your spare bed solutions. INNOVATIONOur Danish designed Sofabeds are more than a sofa and more than a bed! They expand your living space! They offer Nordic values of sustainability, style and function which go hand in hand with innovative, durable designs for everyday use. With strong welded steel frame features throughout, and carefully engineered mechanisms and pocket sprung upholstery. Innovation Living Sofabeds offer the benefits of elegance, compact and discrete function without compromising on comfort or style. We are proud to stock the most popular Innovation Sofabeds, as well as order items not currently on our showroom floor. We have been proudly selling the Innovation Living Sofabeds since 2009, we have a long relationship with the company, who commenced in 1971 and have visited the impressive factory and extensive operations. Innovation Living stand behind their products and export their sofabeds globally to over 86 countries. At Sofabed Specialists we pride ourselves in offering you the most comprehensive range of sofabeds for all your spare bed solutions. TIMBER SLATTEDWe have been proudly selling the Timber Slatted range since 2009, the Australian manufacturer of these sofabeds has been operating in Australia since 1995, with production of this style moved overseas in 2012 . The Belgian designed mechanism is as easy as pulling out a draw, and all of the components of the sofabed are utilized within the sofabed, so there are no cushions that require storing whilst in use. Our Timber Slatted Range of Sofabeds are one of the most compact sofabeds in our range. Our Ottoman sofabed with timber slats in particular, is one of our best sellers, with the smallest footprint externally, and the greatest sleeping area. The sleeping surfaces are generous with a length of over 206cm across all sizes and a combination of durable posture slats and high density foam provide ultimate comfort. At Sofabed Specialists we pride ourselves in offering you the most comprehensive range of sofabeds for all your spare bed solutions. Proudly Australian made Bowman style sofabed is compact, sturdy and value for money. Heavy duty sofabed mechanism and a selection of sofabed mattresses, fabrics and leathers. 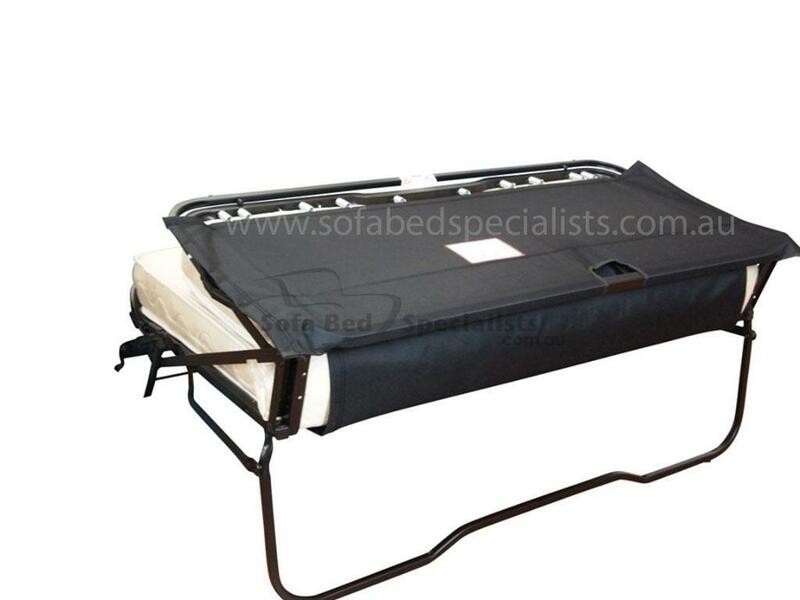 Categories: Sofabeds and Sofas, Australian Made, Double and Queen Sofabeds Commercial, Double Sofabeds, Queen Sofabeds. The Bowman sofabed is compact, sturdy and great value for money. Looks great without piping, as shown on our pictures, you can also select contrast piping, or with the same coloured piping , as shown on our Retro Sofabed – your choice, also available as just a sofa! Please contact us to find out which colours we have in stock. We are the Specialists in Sofa Beds. We have the all the solutions for your spare bed needs. Reviewed by Choice Magazine in August 2007. At Sofa Bed Specialists we pride ourselves on service, quality and giving you the greatest choice of sofa beds. We deliver all over Australia.